The last issue of the Bull Sheet was a precursor to Utah State scoring touchdowns on it’s first 9 drives of the game, thrashing the Wyoming Cowboys 63-19. Let’s hope for more of the same result this week against The Louisiana Tech Bulldogs. After last week’s disappointing loss to Fresno State, this week’s Bull Sheet revisits an unfortunate topic “Bad Dave” (Baldwin). Also read about Ry Bay’s epic new football into video, our chances of going bowling this year, the latest in the #Occupy movement, #OccupyRomney, and as always, a game preview and scouting report of LA Tech. If you like what you see, please use the “Donate” link to contribute to printing costs. The Bull Sheet / Refraction crew have to pay out of their own pocket to print this thing. Any donations are greatly appreciated. The season is almost upon us, and one of my favorite yearly publications has hit the press! The Utah Statesman has released their annual Basketball Preview Edition, an entire newspaper dedicated to Aggie Basketball. And this year we have an electronic PDF copy! What could be better? Check it out by clicking the image to the left. The 2011-12 Utah State Men’s Basketball Team is ready to roll. The Official Utah State Athletics Site was recently updated with current photos and stats on each player. If you’d like to see a pleasing-to-the eye, one page overview of all the players and their pictures without having to click 17 different links, we’ve also updated our “Pictorial Roster” here at USUStats.com! Anyone noticing a trend? The shrinkage continues up in Logan. In years past, new recruits would see a drop in their listed height upon arriving on Logan. Many have attributed this to a strict measuring system. However, this year it’s even wreaking havoc on players who were Aggies last year! Is the water in Logan to blame? Overall this year’s team shrunk a total of 8 inches, and gained a net of 5 pounds. Check out the updated roster by clicking below, and feel free to post questions, comments, or predictions on any of the players you see on the roster. Last week’s football game against Wyoming played host to several Utah State recruits (both basketball and football). While to football team garnered two new commitments in the locker room after the game, the Aggie Basketball team brought in four recruits as well. Three of these recruits have been committed to Utah State for quite some time, specifically, Riley Bradshaw, Quincy Bair, and Marcel Davis. That trio will be joining the team for the 2012-13 season after completing their senior seasons in high school this year. The fourth basketball recruit that was on campus this weekend was 6-foot-7 junior Forward/Center Eric Mika. Eric Mika played his first two high school basketball seasons at 2A Waterford High School, a private high school located in Sandy, Utah. As a Sophomore, Mika averaged 18 points and 11 rebounds per game, leading his team to the 2A state championship game where they came up just short in a 38-37 loss to South Summit. Over the summer Mika decided to make the move to Lone Peak High School, a 5A public school located in Highland, Utah. Lone Peak is a powerhouse basketball school that took the 5A state crown this past year. Despite the fact that Eric lives within the school boundaries, and was moving from a private school to a public school closer to his home, a three-member panel from Utah High School Activities Association’s (UHSAA) executive committee decided (unanimously) to deny Eric eligibility to participate in basketball this coming season. The UHSAA’s transfer rule stipulates that a player must demonstrate a “hardship” in order to be granted eligibility in athletics when transferring schools. Eric’s hardship waiver was requested due to the fact that he had to commute to Waterford, attend early morning seminary classes, and share a gym with the girls team after school leading to later, and longer practice times. His school days were regularly 12-15 hours long. This was apparently not enough to convince the three-member panel to grant him eligibility. Eric has two D1 offers in the bag already, one from Utah State, and the other from Weber State. Unfortunately for Eric, and the teams recruiting him, it looks like he won’t be seeing any action on a basketball court this school year. If you’ve been following the football team this year (who hasn’t? ), you are probably slightly disappointed in the current win/loss record (understatement?). This week’s Bull Sheet has got your back. The Bull Sheet / Refraction crew put our current win/loss record into perspective with the tremendous talent and potential that this team has in another great edition of The Bull Sheet. Read about Robert Turbin, Bobby Wagner, and the overall team’s national rankings, and check out a scouting report of the Wyoming Cowboys. Also, remember that 2012 Basketball commits Riley Bradshaw, Marcel Davis, and Quincy Bair will all be in attendance at the game on Saturday night. 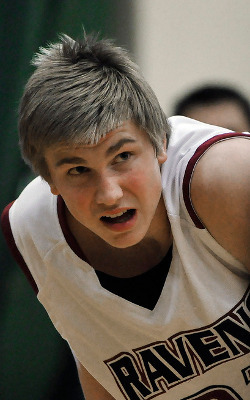 Also in attendance will be new 2013 recruit Eric Mika from Lone Peak High School. Let’s be sure to give them a warm welcome and show them what being an Aggie is all about! 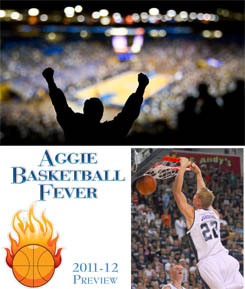 As the weather gets colder, the leaves begin falling from the trees, and college football is in full swing, that can only mean one thing for Aggie Basketball fans… The season is arriving!! This one is easy… Pane will start and Farris will back him up. Barring injury to either of them, walk-on Sam Orchard will redshirt. Bumpus (if healthy) and Medlin will play. Barring injuries to other players, Berger will redshirt. Bruneel will play (likely start). Don’t know what to expect out of Thornton or Thoseby. Wouldn’t be surprised to see a Bumpus/Medlin/Bruneel 3-man rotation on the wing similar to what we had last year with Williams/Newbold/Green. Would be nice to be able to utilize Thornton or Thoseby at times for a little depth . Jarred Shaw will be required to sit out this year (and will redshirt) after transferring from Oklahoma State University. So, the only way we play a true center is if Stone plays this year. I’m not sure if he will play, but even if he does, I doubt he will be starting from day one, so we will likely play two PFs as we have done so often in the past. Likely it will be Jardine and Reed. After those two, I really don’t know who will be third in line. We know what to expect from Grim, but I have no idea about Premasunac or Clifford. Of those three, I’m most excited for Clifford. David Collette will redshirt this season. I Bumpus is healthy, it will be a toss-up on who starts at the wing between Medlin/Bruneel/Bumpus. If not, it will be Medlin and Bruneel.